Dan and Kika met at University. Soon after graduating they founded a successful architectural design-consulting firm, however it wasn’t long before they knew that the rat race was not for them. “One thing was certain, we both dreamt a bigger world existed than the one we grew up in and longed to see it for ourselves”. After the realisation that material things had little importance in their lives and with a burning desire to see the world, they bravely decided to sell everything they owned in search of something better and begin their sailing adventure. They invested all they had in the boat named “Uma”, a 1972 Pearson 36, her name inspired by the Portuguese number 1, which is now the place they call home as they travel the world. Back in September it was Southampton boat show's 50th anniversary, focusing on sustainability and renovation. Dan and Kika were keen to come and see what the show was all about, with a vision to revamp their boat ready for 2019. As their plans become increasingly adventurous, it was clear to them that the electronics on board were going to play an important part in their journey – so finding the right partner was crucial. Dan and Kika had limited knowledge on electronics and had a jumble of various products on board Uma, so they met with the B&G team to get advice on what they might need to give them a comprehensive system that was 100% reliable given their plans. 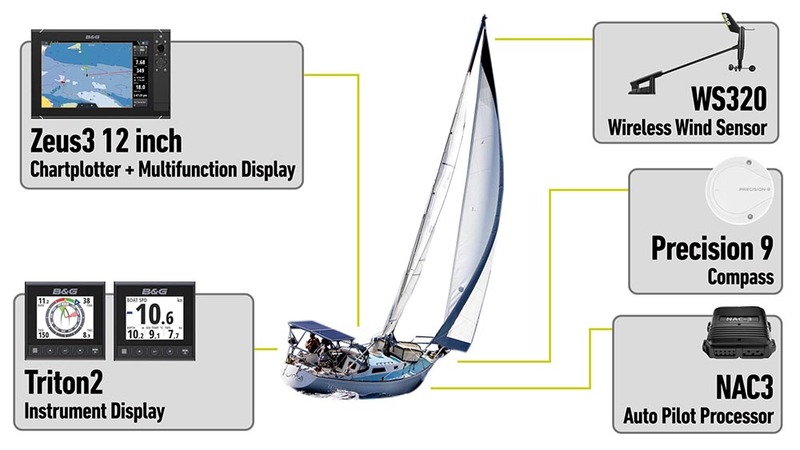 Looking at the vast display of sailing specific products B&G had to offer, they were confident that B&G could provide the right system for their adventures. During November 2018, Uma has undergone a complete refit and is now fully kitted out with the latest B&G technology including; Zeus³ multi-function chartplotter, WS320 wireless wind sensor and Triton2 instruments and pilot controller, all of which Sailing Uma installed themselves. The Zeus³ high-performance multifunction display features a 12-inch widescreen display, incorporating SolarMAX™ HD technology for brilliant daytime visibility and ultra-wide viewing angles. To ensure reliable control in all conditions, Zeus³ incorporates an all-weather touchscreen that works even while wet (something that impressed Dan & Kika when they saw it at Southampton Boat Show). With Built-in Wi-Fi they will be able to access charts, weather information, software updates and online support directly from the display via any Wi-Fi internet hotspot. B&G will be following Sailing Uma as they travel the world, testing the kit in all types of conditions, as well as the ups and downs of life at sea. Follow their journey with B&G as they travel from the warm tropical waters of the Caribbean and sail North to Greenland and Iceland before crossing the North Atlantic to the UK.